Amazon unveils Toshiba Fire TV Edition 4K televisions | What Hi-Fi? 'More than ten' 4K and HD sets will have the full Amazon Fire TV experience built-in, including Alexa voice control. Amazon and Best Buy are teaming up to bring a selection of 4K and HD TVs with built-in Fire TV functionality to the US and Canada this summer. The TVs will be made by Toshiba and Insignia. 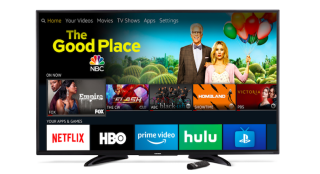 Indeed, the Amazon.com landing page for the tellies reveals a 4K Toshiba set with the very familiar Prime Video interface design. The bundled Alexa-compatible remote will allow voice commands for launching apps, searching for TV shows, playing music and switching inputs, among others. Owners of an Amazon Echo device will also be able to use Alexa voice control hands-free. No pricing details have been released, but we're assuming they'll be affordable. The idea could certainly appeal to Amazon users that in the market for a new 4K TV and don't necessarily want to spend £40 on the latest Amazon Fire TV Stick. When they launch in America, the Fire TV Edition smart TVs will be made available exclusively through Best Buy (including from Best Buy as a third-party seller on Amazon.com). The sets are scheduled to launch in Canada later in the year. How about Europe? Toshiba announced a collaboration with Amazon for a range of Alexa-enabled TVs at IFA 2017, but so far there hasn’t been a sniff of any plans of Toshiba's (or anyone else's for that matter) to bring a Fire TV version to Europe.